Wrong. I have, yet all chests are shown as opened to me. At last, someone from ANet addressing it. I wonder if we stopped spending money for 4 or 5 days if that would cause someone in noddy land to wake up and look to see what the issue was? Reading bug reports where no progress is given to a found fault or problem is pointless, it only give us the small fry something to kitten about. Sunken Chest is bugged, we can't do a thing about it, apart from black list the trading post for a week or don't spend money - someone will wake up when they work out the auto payment for their Ferrari wasn't made. It ain't hard Mr and Mrs Dev or tuther... just a small word would suffice. It's not caused by a random key drop. I have the bug, and I've never had a random key drop. This does not explain my experience with these chests at all. I'm at 5/10 and 6/10 with the unchecked chests on the list all appearing as already opened. On one account I've only opened one chest per day, having no additional key drops from mobs. My first two cycles through the list of chests had no issues, despite my doing each run in a different order. Now on my third run, I've had the same chests not resetting for several days. I've been stuck at 6/10 for 3 days, checking every unchecked chest daily. On my other account, I did get an extra key or two from drops in my first cycle. That did not cause any reset delays in my 2nd cycle, even though there was a day or two where I used more than 1 key/chest. As with my first account, all chests reset when I completed 10/10 on my first cycle. Now on my third cycle, 5 chests are not resetting. Whether based on timer or the achievement list, these chests should be reset. From what I've seen it's clearly based on the achievement checklist, but that is definitely bugged and not allowing some to reset. I too have the same problem. I have 9/10 in hero panel and only Timberline Falls missing. Two keys now and still no joy. Checked all chests yesterday and all chests inactive. Hope this will be be resolved asap. Thank you. Same here, second time doing the achievment. Stuck at 4/10 none of the 6 chests are available - all of em are not "marked" but are open. I encountered this problem a couple days ago, on my 3rd run through, doing the list in order (top to bottom). I submitted a ticket, with screenshots yesterday, when it was still an issue after 2 days. I usually started my dailies by sitting on a sunken chest, until I killed 10 krait, and then opening that chest for the day with my daily key. When I arrived at the chest, the words weren't there and it showed as open. I killed my krait, collected my key, and tried the chest anyhow- no luck. All the others without checkmarks on my list show as open with no markings, and no ability to open them. The only things I may have done differently was trying to open the chest less than 24 hours after the previous one. My krait key daily had reset, though, so I didn't think there would be any issues. Side note, I was lucky enough to receive one extra key drop the very first day of the update (fractals drop) and another the same day the error began for me. (or the day after, not sure...I just know I have 1 more key than I should for the number of days I haven't been able to open the chests) I'm not sure it was that key, as it didn't cause problems for me the first day, and I already wasn't able to open them when I got another random extra as a drop. i didn't open any chest few few days. i have 11 keys. today i tried all, with openening only 3 of them. i did check all locations, and all chests. Very interesting seeing this picture. I have exactly the same problem with exactly the same chests. Adding to the chorus; half of the chests haven't reset since beginning my third cycle. Opened those I could, and are simply waiting for the rest (checked them regularly so far) while gathering keys, should it either be a bug or some elaborate achiev mechanics at play. The other 4 I managed to get, althought Bloodtide cost one took me 3 days before I was able to interact with it, I completed the chests 2 twice now, this is the 3rd time around, or it would be if I could open them, its been several days now and I still cannot interact with the above locations. Also stuck on my second time doing the achievement at 4/10. I get keys but the chests are all open and unusable. I can see other players killing Krait and looting the 'empty' chest, (I can hear the opening creak sound for them) but they're still just glorified scenery to me. Are three days I can't open the last four chests to complete the achievement for the third time. Actually the areas I nedd are: Snowden Drifts, Lornar's Pass, Timberline Falls and Mount Maelstrom. I usually open sunken chests with one character, one each day. Sunken Chest in conclusion after all my testing is not a bug it is a complex achievement yes. Someone has posted their response from ANet support elsewhere: this is a known bug, and the developers are working on it. I have 4 keys and I cant open any of the chests.ANET please fix this mess. I hope you are joking, because you can not possibly have read the bug descriptions in this thread and come to the conclusion that this thing that everybody knew already was the problem. Actually, I have another interesting factoid for the heap: a friend of mine who does not do the keys all that regularly went to a sunken chest which at first appeared to be functional (lid closed, item name displayed). She and another player killed a few spawning krait to earn the daily key. The other player was done first, opened the chest and... then it bugged out for my friend. The lid stayed open and the name was no longer displayed, and when she got her key she could not use it. 2nd run and stuck. Mt. Maelstrom, Snowden drift chests bugged. Why is this not listed on the known issue tracker? I had just completed my 2nd time through the achievement when they stopped working. I now have 10 more keys collected, same issue. I'm not inclined to visit every map to see if 1 or 2 work when they're all supposed to. Reported this days ago. Come on, Anet! This is slack that's hard to tolerate! Just wait until the next patch when they say they've fixed it. Just continue to collect keys. I've completed the cycle twice now (10ap) and all my chests are now bugged. I have 10 keys, and will collect more each day until I have enough for the 50ap, but can't seem to progress. The weekly reset day doesn't seem to have fixed it. It' now been over a week. ANet support, as quoted by other players, and directly in a reddit thread, have said they are aware of this. It is a bug, and the developers are working on fixing it. I have this very same bug too, and it's annoying. I'm stuck at 6/10 of my third run of the achievement. I've been thinking ... it is weird that this bug manifests more or less at the same point to everyone (somewhere around the middle of the third run). I thought about what do players with this bug could have in common, and the only thing I could think of is that we may have looted a similar amount of Swim-Speed Infusions +10. So I checked my amount, and it's 99 ... which is a suspicious number, if you ask me. It may be just a coincidence,. But this bug (and the idea it may be that) annoys me out of my mind. So, can I ask you, my fellow bug-affected players, what is your amount? 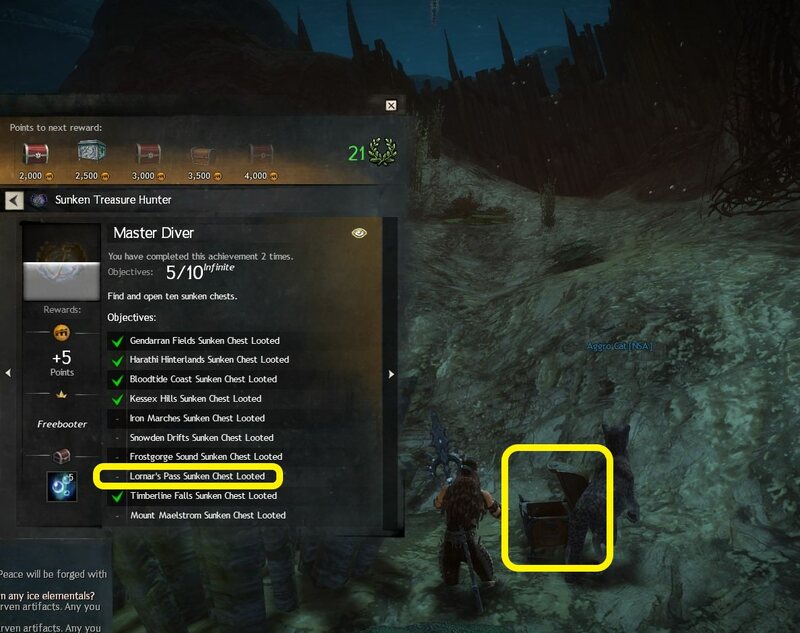 You should subtract the amount of Swim-Speed Infusions you bought at the trading post, if you happened to have bought some: I already verified in game that those don't count. It is only "Sunken Treasure Hunter"
3rd run and all is well and proceeding as planned. Sold some more swim infusion today. Third run bugged for me. First two went swimingly Thanks, Gaile, for the info I will look forward to the fix. The bug finally hit me tonight. I'm on round 3. My habit has been to work up from the bottom of the Master Diver list. I successfully, one a day, got Mount M, Timberline, Lornar's, and Frostgorge. Then tonight I happened to get a key drop (from Augury Rock, I think) and headed to get my 10 krait to get a second key. Note, this is the first time I've had a key drop other than from the krait daily. I may have had key stacks at the very beginning of the Event, thanks to the npc, but I'm not 100% sure this isn't my first time with a key stack. I went to Snowden and then Iron Marches, the chests in both were in the dull open state, no yellow name, no interaction. Then just to see, I split the keys, putting one in shared inventory and leaving one in my bags. Voila, the Kessex chest was available and used the key from my bags. I went to Bloodtide -- broken. Harathi -- broken. I moved the key to my bags and went to Gendarran, but that was also broken. So tldr it could have to do with having more than one key at a time? edit: just to check, I took an alt to Snowden to spot check, moving the key from shared to her bags. No good, chest was still broken. I'm also having this problem. I've completed Master Diver twice and I go down the list, 1 key per day. I got stuck on the third round, 6 out of 10 done. All the chests appear open now, even ones I haven't opened according to my checklist. I collected 1 key and checked the sunken chests each day since but no luck. Now have 4 keys. But before that, I'd only have 1 key in my inventory at a time so I don't think that's what broke it. Do? Did. It's one of those things that never sticks. Just FYI: I got 7/10 - Snowden, Timberline, and Mt. Maelstrom are all open chests when they are supposed to be closed and locked. Sometimes I had to push "f" twice to open a chest and be close to it. Also maybe try a different character with the keys. Anyone else notice that you also can't click on the individual collection marks to show you the location anymore? Wait a minute when did it come out there maybe a bug with the regular treasure hunter collection? Been working on that forever and thought it was just bad rng. Two completely different things with no related mechanics whatsoever. Exact same thing happened to me. Got 2 chests and rest open. I'm on my 3rd round too. I can kill the Kraits and i get the key, but i can not open 3 of the chests even though it is like 10 days now since i open those 3. The issue with Treasure Hunter is a different one. When magic find was removed from gear, many drops that had magic find was changed or replaced. Possibly as a side-effect of this, now bosses that drop trinkets part of Treasure Hunter often drop bugged versions of those trinkets that are fine level 80 trinkets with a single Condition damage stat and an amber pebble upgrade on it, instead the level 80 exotic trinket. Getting the bugged fine feels worse than not getting anything at all, since there's no way to 'upgrade' the fine version to exotic, and the fine version doesn't even have proper level 80 stats, so it can't even be used to equip it Those bugged versions should just be removed..
Well I would certainly be discouraged to discover that is what they were working on lol . . .
That isn't a "bugged" version, that is a perfectly legitimate version that also drops from the same boss. You are experiencing that an item is rare, not broken. Yes they are completely different, but the internal message I received left me with some small question in my mind, so I'd rather clarify and be 100% accurate than guess and maybe put up incomplete info. Just wanted to let everybody know that the update today did NOT fix this bug. I am waiting on all 4 of my accounts for a fix. Also lower the reset time for chests along the fix or give us a way to use all our stacked keys because if we have 10+ of them and we continue doing the dailies, we will never run out of keys. For sure, seems like very bad design from the start. Doesn't make sense to gate both ends of this, RNG/Time gating the keys and then also time gating the chests on the back end. How did all of this get a thumbs up on the "fun"? I would like to torpedo the entire chest idea. The payoffs .. .the worst ... the drops, the same, Archranis has it right, a pure and simple GRIND with no rainbow and no pot of gold at the end.